I have come to making and eating marmalade late in life. I didn’t care for the taste as a child even though it graced the breakfast table every morning; I preferred Ready Brek or Rice Krispies. To me, people who liked marmalade were of a certain type. Now after many years I have joined those certain types and have grown to love the taste! After a very long journey of failures, I have the recipe I am happy with – well, for now that is, until I discover a better one. The recipe originally was hastily written down on the back of an envelope in a shorthand style of instructions. I thought at the time that every little detail was obvious and there was no real need to write it out, that was until I came to make it and then I struggled. After a little trial and error I have come up with a recipe I enjoy eating. 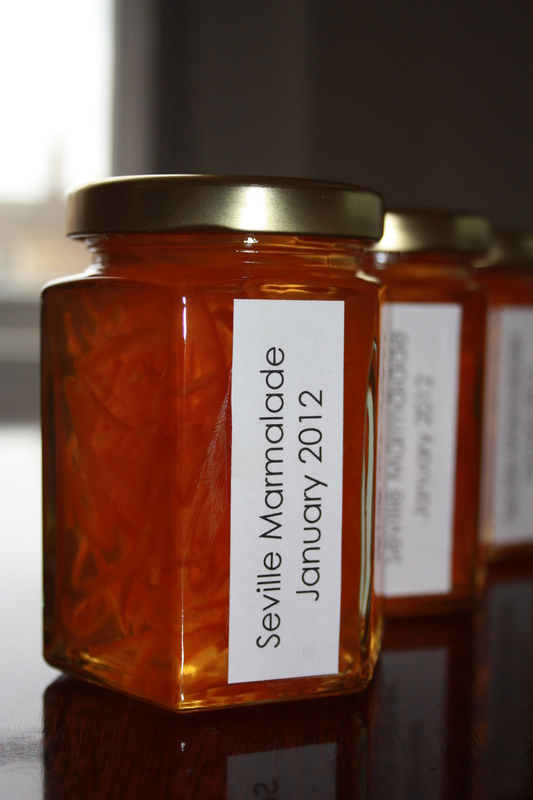 I entered this recipe into the World Marmalade Awards in Cumbria and won a gold award. Wash all the fruit well. Using a potato peeler, peel the zest off the Seville oranges and sweet orange. Set these aside. Cut up the remaining fruit into small pieces and place in a preserving pan with 2 pts of the water and the lemon juice. Cover and leave over night. With a pair of scissors or a sharp knife cut the peel as you like, either thin or coarse, and place in a second pan and add the remaining 1 pint of water. Cover and leave over night. The following day put both pans on to simmer for 2 hours. Partially cover the peel pan with a lid to stop the water evaporating too quickly. If the water level becomes too low in either the fruit pulp pan or the peel pan add some hot water just so as to cover the fruit. After 2 hours check that both the fruit pulp and peel have cooked through. The orange pulp in the main pan should be very soft – if not simmer for another hour. The best way to test the peel is to taste a small piece. If needed return to the heat for a further hour. Strain the fruit pulp through a sieve into a clean bowl. Also strain the peel into the same bowl. Set aside the peel for now as this will be added later. Measure the total liquid in the bowl from the combined pans – this should be about 1000ml/ 1 ¾ pints. If not add a little water or boil a kettle and pour over the fruit pulp allowing it to drain through a sieve and add this to the marmalade liquor. If there is too much liquid, place back onto the heat and boil down until the correct volume is achieved. Put the sugar into a roasting tin and place in the oven to warm through. Pour your 1000ml of marmalade liquor back into the cleaned preserving pan and return to the heat. Slowly add the sugar, stirring it gently, don’t put it in all at once. It is very important to make sure all the sugar dissolves properly. When the sugar has all dissolved add the peel and bring the whole lot to a rolling boil. Removing the white scum as it forms. DO NOT WALK AWAY – this amber nectar can turn into the most vile molten lava which will show no mercy on your cooker, unless you like spending an afternoon cleaning – trust me I have been there, never to be repeated. The marmalade now needs to reach setting point of 105C/220F . There are two methods to test whether it has reached setting point, one is to put a little of the marmalade onto a chilled saucer and put into the fridge and see if it crinkles when pushed back, the other is to use a thermometer. I prefer to use a jam thermometer because it saves all the standing around waiting for the marmalade tester to cool. Once the marmalade has reached setting point, remove from the heat and leave the marmalade to stand for 10-15 minutes. This should stop the peel floating to the top of the jar when set. After 10-15 mins pour the marmalade into warmed sterilised jars and seal. Remember to label and date. I like to keep a jar from the previous year so I can compare tastes.